Aaron Hoskins is the chef at Birds & Bubbles. 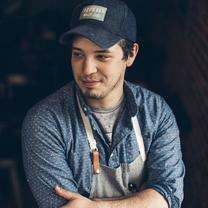 He started his culinary career after relocating to Richmond, Virginia in mid-2008. Soon after, he began working his way through some of the city’s best restaurants, including Comfort, Secco Wine Bar, and The Rogue Gentlemen. "The last 2 weeks have been so busy I forgot to post about the awesome food @maxouboon... 😍😍😍"
"This place is probably my favorite restaurant in Columbia (even though it’s in Cayce). Best fried pork chop I’ve ever had. Collards, field peas, Lima beans, mac n’ cheese, fried okra, fried chicken, I might die. And “the tea is always free.”"
"The tomato tarte tartin at @eatatfig is all I wanna eat forever and ever." "Still in awe of last night's dinner at @empellon midtown." "Perfectly balanced, clean gazpacho (with the radishes from the garden out back) with these crazy pops of acidity and smoky roe. So much talent in this place." "All of them. Try them all. They taste better than they look."